These are the first whoopie pies I've tried out so far. I got a whoopie pie tin on Amazon to keep all my whoopie pies at least similar in size. The recipe is sort of a whoopie pie version of a banana cream pie. It's topped with salty caramel which was to die for, I literally could've just sat and eaten it with a spoon. Deelish! The mixture makes 9 large or 24 mini whoopie pies. If you're going to be using baking trays, line them with greaseproof paper, for whoopie pie tins, make sure you grease them. Sift together the flour, baking powder and baking soda. Stir in the salt and set the dry ingredients aside. In a separate bowl, mash up your banana and then mix in the crème fraîche and set it aside too. In a third bowl, cream the butter and both sugars together until they are light and fluffy. Add the egg and mix well. Add the banana mixture and continue to beat until everything is combined. Add the dry ingredients until everything is just mixed. Chill the batter in the fridge for 30 minutes. In a bowl, mix together your sugar, salt and cornflour. Whisk in the egg to form a paste. Heat the milk, vanilla pod and seeds in a saucepan until it begins to froth, but before it starts to boil. Remove the pan from the heat. Slowly pour half of the hot milk mixture into the bowl, whisking as you add it. Pour the conents of your bowl back into the saucepan and whisk. Return the pan to the heat and whisk until the custard thickens. Strain the custard into a heatproof bowl. As it begins to cool gradually stir in the butter. Cover the custard with clingfilm, pressing the clingfilm right onto the surface so as to prevent a skin forming. Leave the custard to cool for 20 minutes, then chill for a further 2 hours. (Custard will keep in an airtight container in the fridge for up to 5 days, so this can be made in advance). Before using the custard, whip the cream and fold into the custard. 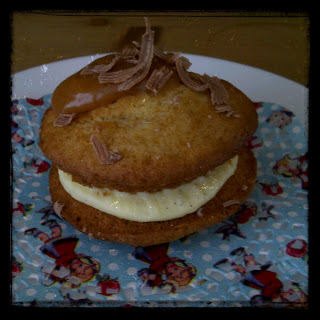 Remove your chilled batter from the fridge and using a teaspoon drop your batter onto the baking tray/ whoopie pie tin. Bake on the middle shelf of the oven for 10-12 minutes for large whoopie pies, or 8-10 minutes for mini whoopie pies. Remove the whoopies from your tray/ tin and place on a wire cooling rack to cool completely. Put the water in a heavy bottom saucepan. Add the caster suagr and heat gently to dissolve, swirling the pot around without mixing the contents. Once the sugar has dissolved, turn the heat up to high and bring it to the boil. Continue to heat until the caramel is darkening (keep an eye on your pot, the caramel quickly darkens and can get very bitter if left for too long). Whisk in the cream, be sure not to splash the mixture! Add the butter and sea salt next and continue to whisk until smooth. Let the caramel sauce cool before using it. (Can be kept in a sealed container in the fridge for up to a week). Take one whoopie half, add some of the custard cream, then another whoopie half. Top with a drizzle of salty caramel and chocolate shavings (optional).